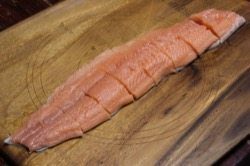 It’s the perfect time of year to smoke salmon and if you can get fresh wild caught salmon, then that is the best way to go. 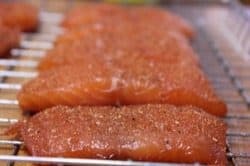 You can also use other types of salmon and even frozen and farm raised salmon will become amazing once you’ve smoked it following the directions in this recipe. 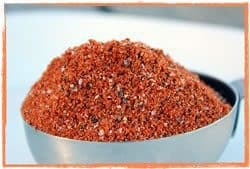 Be sure to use my original rub (purchase recipes here) to give it that perfect low salt seasoning that it needs after the dry brining process. 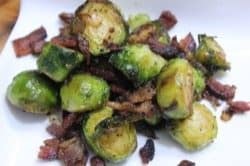 In this edition, I will also be sharing a recipe for smoked brussel sprouts tossed in bacon grease and fancied up with bacon and onions .. I know, it’s not healthy but you can always omit the bacon and the bacon grease if you need to take out some of the “bad” stuff. 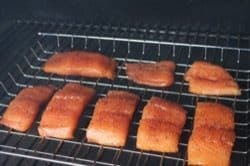 I’ve been using my original rub on smoked salmon for nearly a decade and it always gets rave reviews. My original rub is low on salt and big on flavor so you don’t have to worry about getting things too salty after the overnight dry brining process. Obviously, fresh, wild-caught salmon is the very best if you can get it and you can afford the higher cost. I always tell folks to purchase the best you can find and afford and start from there. 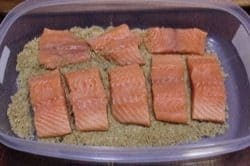 If you have to purchase pre-frozen or even farm raised salmon for this recipe, it will still turn out great and just to prove it, that’s exactly what I did. 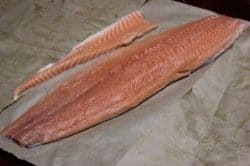 The flesh of farm raised salmon is a different color due to the different diet that it gets vs. what a wild salmon would eat.. well.. in the wild. Wild salmon tends to have richer flavor as well. 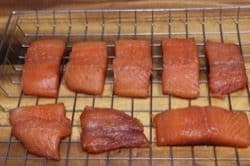 Regardless of what you start with, dry brining and smoking salmon will certainly make it taste better and you will end up with something that most folks will find very delicious. You can smoke salmon with the skin on and I do that often. You can also brine it whole and even smoke it whole but in this version, I am going to show you how to cut it up into serving size pieces and remove the skin for a better brining and smoking process. To begin, remove the fish from it’s package and lay it on a large cutting board. We’ll want to search and remove any pin bones first thing so run your fingers along the top of the salmon pressing down just slightly. If you feel any bones protruding up out of the flesh of the fish, use some clean needle nose pliers or a pair of tweezers to grasp the pin bone(s) and pull them out. This is a very important step and you don’t want anyone getting one of these in their plated fish so be meticulous about it. I decided to remove the really thin edge of the salmon but you don’t have to.. it just looks better that way and gives you a more even thickness throughout. Next we will cut the fish into serving size pieces. The easiest way to to this is to cut the fish in half, then cut each of those pieces in half and then each of those in half yet again. You’ll end up with 8 servings. Now that we have smaller pieces, it’ll be really easy to remove the skin. Slide a sharp knife under the flesh of the fish and just above the skin. With the knife angled slightly downward, run it all the way to the other side of the piece of fish to separate the fish from the skin. Once all of the skin is removed, rinse the pieces of fish under cold water to get rid of any scales that are trying to cling to the fish. Lay the fish on several layers of paper towels and then pat the top and sides dry with another paper towel. The salmon is now ready to be dry brined. 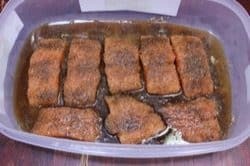 I have often wet brined fish and this works well but in this recipe, I will be dry brining the fish with a mixture of dark brown sugar and kosher salt. Measure 2 cups of dark brown sugar into a medium sized mixing bowl. Use a fork to make sure there are no lumps. Add ¼ cup of coarse kosher salt and 2 tablespoons of coarse ground black pepper. Make a thin layer of the dry brine mixture on the bottom of the container to lay the fish on. Lay the fish on the layer you just made. Now pack a thin layer of the brine mixture onto the top and sides of the fish. If you have some dry brine mixture left over, it can be discarded. Put the lid on the container and place the fish in the fridge for 6-8 hours or overnight. The dry brine will draw moisture out of the fish and then some of the salty, sugary mixture will be drawn back into the fish. Thoroughly rinse each piece of salmon under cold water to remove all traces of salt, sugar and pepper. The flavored brine has done it’s job. Lay the pieces of fish onto a layer of paper towels to help dry the fish. Pat the top and sides of each piece as dry as you can. 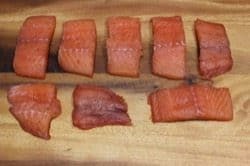 Lay the pieces of salmon onto a Bradley rack or cooling rack to dry and form the pellicle. Note: The pellicle is a sticky surface that forms on the fish. This helps to hold in the white fatty liquid called albumin and creates a great base for my original rub and the smoke. Place the rack of fish back in the fridge uncovered for about 2-3 hours to continue drying and allow it to form that pellicle. You’ll know when it’s ready because it will be shiny and tacky to the touch. Now that the pellicle is formed, sprinkle a very light layer of my original rub (purchase recipes here) onto the top of the salmon pieces. The salmon is now ready for the smoker. Tip: Salmon is real bad about sticking to these racks and smoker grates. Remove the fish, spray the rack with oil or non-stick spray and then replace the fish right before you put them in the smoker. This should prevent the smoked salmon from sticking. 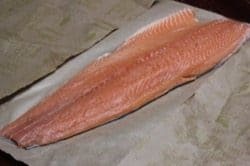 You can begin getting the smoker ready about 30 minutes before the fish is finished drying so everything will be ready once you season up the pieces. Set up the smoker for cooking at very low temperature of 180°F. If you can’t go this low (sometimes a problem for propane smokers), just smoke cook the fish as low as you can. I recommend keeping a light smoke going for the entire time if possible. Monitor the temperature of the salmon so you can remove from the heat the moment it reaches 145°F. At 180°F you are looking at about 1 hour and 30 minutes however, it’s not done until it reaches 145°F even if it takes more or less time than 1.5 hours. Speaking of temperature, there is no way to ensure that meat is safely done without a thermometer. 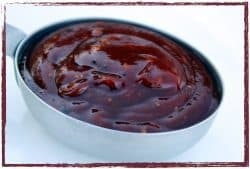 For this recipe I recommend an instant read thermometer like the ThermoPop or you can use a leave-in thermometer like the “Smoke” by Thermoworks that alerts you when the perfect temperature has been reached. I use Thermoworks products exclusively.. the safety of my family and friends is worth it. You won’t find a more accurate and high quality range of thermometers than the ones made by this company. 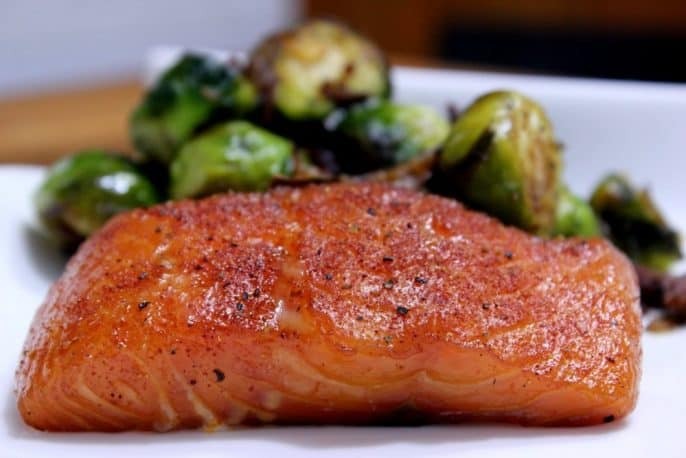 If you are interested in the recipe for smoked brussel sprouts with bacon and onions that we paired with this smoked salmon recipe, you can get that HERE. 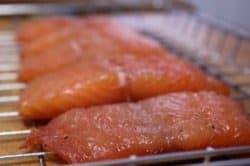 In this smoked salmon recipe, we are using a dry brine with brown sugar and kosher salt and smoking the salmon with cherry wood to a perfect finish. 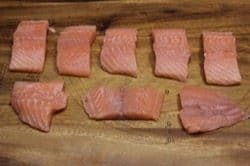 Remove fish from package and lay it on a cutting board. Cut the fish into 8 equal servings. Using a sharp knife, remove the skin from the flesh. Rinse the fish under cold water to remove any scales. 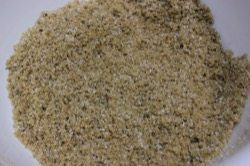 Make dry brine mixture using 2 cups dark brown sugar, ¼ cup of kosher salt and 2 TBS of coarse ground pepper. Mix well. Create a thin layer of the dry brine mixture in a lidded plastic or glass container. Lay the dry pieces of fish onto the thin layer. Create a thin layer of the dry brine mixture on the top and sides of the pieces of fish. Pat it into place with your hand. Put on the lid and place container into fridge for 6-8 hours. Rinse the fish well under cold water and pat completely dry with a paper towel. Place the fish onto a cooling rack and into the fridge to dry for 2-3 hours or until the outside of the fish is tacky to the touch and has a shiny appearance. 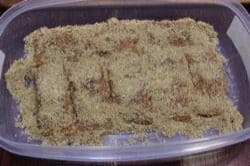 Sprinkle a very thin layer of Jeff’s original rub onto the top of the salmon to season. Setup your smoker for cooking at about 180°F with indirect heat using cherry wood for smoke. Let the fish cook for about 1.5 hours or until the fish reaches 145°F in the thickest part. 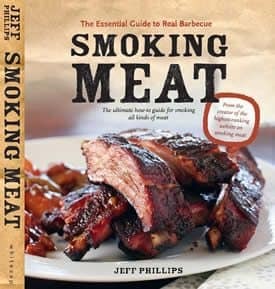 Remove from the smoker and serve immediately.